Narrative:Devastation from yesterday's structure fires near 19th/Sherman resulted in an estimated $500,000 of property loss and millions saved from the potential destruction of a neighborhood. According to accounts from the Spokane Fire Department's Special Investigation Unit, two single family residences were considered catastrophic losses. A third single family home received heavy fire damage to the deck, siding, and attic. The fire was extending into the third home from through a kitchen window and exterior door when firefighters successfully extinguished it, preventing damage on the home’s interior. A fourth structure sustained smoke damage to one of the four apartments. The tenant had a box fan pulling air into the structure through a window facing the fire and the fan was left operating after she evacuated. In addition to the structural damage there were three cars, one motorcycle, and a boat that were completely consumed by the fire. There were no civilian injuries and one minor firefighter injury as a result the incident, which lasted several hours. The official fire cause remains undetermined, however both prospective scenarios appear accidental. The details will be shared when we learn more from the SIU. Narrative:This morning Wednesday, August 7, 2013 at 0635 hours the Spokane Fire Department responded to the Wishing- Well motor home park located a 4911 N. Florida. Spokane Engine 15 was the first to arrive, and reported a single wide mobile home fully involved with fire E 15 also reported that the structure was vacant. E15 immediately directed hose leads to protect the exposures on either side of the burning structure. Other arriving units were assigned to conduct search operations, and assist with extinguishment of the fire. There were no injuries to fire personnel. Cause:The cause arigin of the fire is under investigation by the SFD SIU. Narrative:On Monday, August 5, 2013 at 4:49 PM, 6 Companies of Spokane Firefighters, 4 Engines, 1 Senior Ladder and 1 Heavy Rescue under the direction of Battalion Chiefs Donahoe and Moline, responded to an explosion and resulting fire at 3704 West Olympic Avenue in Northwest Spokane. Spokane Firefighters arrived quickly to find a single family home heavily involved in fire and beginning to extend to a two-car garage and neighboring home to the west. First arriving companies were met by floor refinisher workers that explained they were applying a petroleum based lacquer on the floors in the home when a pilot light ignited the fumes causing an immediate explosion and resulting fire. The worker confirmed that the home was unoccupied and that the workers were all accounted for. The fire was fueled by highly flammable chemicals and created extreme fire behavior for the first alarm companies. The incident was subsequently upgraded to a working fire adding additional resources to assist in the efforts to contain the fire’s progress. The fire was brought under control in 45-minutes and was successfully contained to the home of origin and firefighters prevented extension to the adjacent buildings. Despite the heavy amount of damage from the blast and fire, there were no injuries. Cause:The official cause of the fire remains under investigation by the SIU. Damage:As a result of the explosion and fire the structure is deemed untenable. Assisting the two residents in their need for temporary housing were staff from the City's Housing Department and volunteers from the American Red Cross. Narrative:On Monday August 5, 2013 at 6:48 PM, a total of four brush engines, under the direction of Battalion Chiefs Moline and Donahoe, responded to a brush fire that was upgraded from a single company response in the area of 2600 East Upriver. Firefighters arrived to find a column of smoke and 3-4 acres of light to heavy brush burning near apartment buildings. The incident started alongside the steep hill below the railroad tracks and just above North Crescent Avenue. Although the fire was slow moving, the initial company quickly assessed the need additional units due to there being three separate fires in steep and rocky terrain. As companies arrived, the additional personnel tied into the railroad right-of-way and were strategically placed on both west and east flanks halting the fire from its advance into adjacent multi-family homes. With relatively slow wind speeds, increasing relative humidity and cooler temperatures, firefighters were able to knock down the flames in less than 1 hour. The fire was completely extinguished with no threats to civilian or any structures. Cause:The fires (all three) were accidental in nature and caused by a BNSF train traveling through the area moments before the fire was discovered. Damage:Wildland only, no structures were involved. Total amount burned was 4 acres. The Spokane City Fire Dept. dispatched firefighting crews and their apparatus to 2203 S. Inland Empire Way at 14:39 hrs on Sunday afternoon, August 4th , for a reported structure fire at that address. 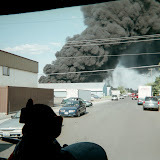 Engine #4, from the near-by Browne’s Addition neighborhood fire station, reported by radio that there was a large black plume of smoke visible in the sky as they turned south onto Inland Empire Way. In their radio report they requested that the fire be up-graded to a “working fire”, the up-grade would add an additional ladder truck to the call. Engine #4 was the first apparatus to arrive on scene. The officer on that apparatus again reported by radio that there was heavy fire at the rear of the house on the second story of the wood/framed balloon constructed structure and that it was extending farther into that space and starting to come out of the gable ends of the second story at the front and the rear of the house. Engine#4 also reported that the house appeared to be vacant and that they were going to make an aggressive offensive attack on the fire through the front door and up the staircase to the, by now, heavily involved second story. The second apparatus to arrive on scene was Ladder#4, from the same station, and they reported that they would be going inside with Engine#4 to begin the process of opening up walls and pulling down ceilings to get at the rapidly growing fire they encountered on the second floor. As additional fire crews began arriving on scene they were assigned to various tasks which included a back-up hose line to protect the crews already going inside to fight the fire, water supply, an additional hose line to protect the interior stairway to the second floor, the additional ladder crew was assigned to go to the roof to begin vertical ventilation, other crews were assigned to do a thorough search of the home for any potential victims, a Scene Safety Officer was assigned, and the mandated RIT (Rapid Intervention Team) was established for any needed rescue of a lost or down fire fighter. There were no victims in the building but there were indications that “squatters” may have been using the house. Avista was requested to respond and their crew disconnected the electrical power to the structure. There were no reports of injuries to any of the fire fighters at the scene. The building sustained severe damage on the second floor and on the underside of the roof structure; however the main floor suffered very little damage due to the quick attack by the fire fighters. The cause of this fire is being investigated by the Spokane City Fire Dept.’s Special Investigation Unit. Four engines, two senior ladders, one heavy rescue truck, and two Command Vehicles delivered 24 fire fighters to this incident. Under investigation by members of the Spokane City Fire Dept. 's Special Investigation Unit. Severe fire damage to the second story and to the underside of the roof structure.